Two letters that are said to have been written by Saint Patrick still exist, the Declaration and a letter to the soldiers of Coroticus. The Declaration is a letter describing his early life, captivity and his mission in Ireland. Saint Patrick is the Patron Saint of Ireland. He is also the patron Saint of Nigeria, engineers, against snakes, snake bites, against ophidiophobia (fear of snakes), and many cities throughout the world. St. Patrick was taken prisoner by Irish raiders when he was about 14. They held Patrick captive for six years. While he was a slave in Ireland he worked as a shepherd. Patrick escaped from his Irish captors when he was about the age of 20 and returned to his family in Britain. Saint Patrick is believed to have escaped by walking 200 miles to the shore of Ireland. He then convinced some friendly sailors to return him to his native Britain. Saint Patrick used the shamrock to help explain the Holy Trinity to the Irish. To help the Irish better understand the symbol of the cross and its importance, St. Patrick is said to have incorporated a sun. This incorporation of the sun and the cross gave us what is commonly known as a Celtic Cross. Saint Patrick studied to become an ordained priest in Britain. He returned to Ireland about 433 where he began converting the Irish to Christianity. 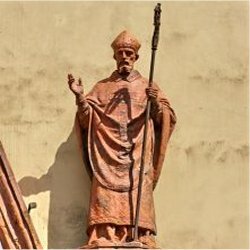 Saint Patrick baptized thousands of people and ordained priests. Saint Patrick is officially recognized by the Catholic Church, the Anglican Church, the Orthodox Church and the Lutheran Church. His feast Day the 17th of March is recognized throughout the world. In art, Saint Patrick is often depicted driving snakes before him. Other portrayals of Saint Patrick show him with a Celtic Cross or a shamrock. Saint Patrick is one of the very few Saints who died of natural causes. This entry was posted in Holiday Trivia, People Trivia and tagged Saint Patrick Information, Saint Patrick Trivia, St. Patrick Trivia by Jane. Bookmark the permalink.